JI attended a Protestant church a while ago for a worship service. A friend and colleague had died, and I was there to pray for him and his family. The church was beautiful. High ceilings, with stained glass windows on the back wall of the sanctuary. A pulpit made of beautiful wood, raised high in the old style, resting under a round baldachin suspended from the ceiling. A large and superb pipe organ was behind the pulpit. The Bible rested on a stand on an altar in the center of the sanctuary. It was only two weeks since Easter Sunday, and a Paschal candle was in its floor stand just next to the altar. The service began with a processional hymn, immediately followed by the lighting of the Paschal candle by the presiding minister, vested in black robe and stole. There was a penitential rite which included the recitation by the congregation of a prayer of contrition, and a prayer by the minister for forgiveness for our sins. Another hymn, and then three readings: One from the Book of Micah, one of St. Paul’s epistles, and a reading from the Gospel of St. Luke. Then the minister delivered his sermon, reflecting on the Scriptures. It was well prepared, sincere, and insightful. He is a good preacher of the Word. The sermon was followed by the recitation of the Apostles Creed, a prayer by the minister, and then the praying of the Our Father. The service ended with a concluding prayer, and a recessional hymn. When I left the church I was glad that I had attended, and had the opportunity to pray with my deceased friend’s family and other professional colleagues who were present. But it was not complete. The Eucharist is not the center of the teachings of this church. There is no belief in the Real Presence of the Eucharistic Lord. Nothing happened on that altar in the center of the sanctuary. It was just a table for the Bible to rest on. The philosopher Martin Heidegger wrote that language is the house of being, that being discloses itself in words. And indeed the words of Scripture are the house of the Divine Being through which he reveals himself to us. But Jesus did not become incarnate of Mary to leave us only with his presence in the written words of his teaching, no matter how intense that presence may be. He did not declare at the Last Supper that he was giving us his Body and his Blood so that we would experience him and exist with him after his Ascension only through his words as recorded by the inspired writers of the sacred texts. Nor did Jesus stand in the synagogue at Capernaum that day in Galilee, as St. John tells us in the sixth chapter of his Gospel, and tell his disciples that unless we eat his body and drink his blood we will not have life everlasting, if we were to only or even chiefly meet and encounter him through the Scriptures. Jesus did indeed proclaim and preach on the meaning of the Scriptures, and he explained how those holy words pointed to him and his salvific mission. He went on to reveal that after his Ascension he would continue to be present to us in the Scriptures in a special and necessary way, as well as in his creation, especially in our fellow man made in the image of God and whom we encounter every day. But he taught that in a way that is both cosmic and intensely personal, unlike his presence in the Scriptures, he would be present to us — body, soul, and divinity — in the Holy Eucharist, the Sacrament of life itself. For the most holy Eucharist contains the Church’s entire spiritual wealth: Christ himself, our passover and living bread. Through his own flesh, now made living and life-giving by the Holy Spirit, he offers life to men. Consequently the gaze of the Church is constantly turned to her Lord, present in the Sacrament of the Altar, in which she discovers the full manifestation of his boundless love. The encounter with Jesus in the Eucharist is neither optional nor a mere memorial. “I say to you, unless you eat the Flesh of the son of Man and drink his Blood, you do not have life within you” ( John 6:53). But if we do partake of his Flesh and his Blood, we will have eternal life. “Whoever eats my Flesh and drinks my Blood has eternal life, and I will raise him on the last day. For my Flesh is true food, and my Blood is true drink. John 6: 54” Catholics have heard these words so many times over the years that too many have a disturbing insouciance, if not virtual deafness, to the promise of God that those words contain. That is unfortunate. The stakes are high. If ordinary language is the house of being through which truth is disclosed, the truth disclosed in the language of Scripture is chiefly that of promise. The words in the Bible about the Eucharist are replete with the nothing less than the promise that if we worthily eat and drink the Body and Blood of the son of Man in the Eucharist we will live in eternal happiness with the God of love. Consummation of Jesus’ flesh and blood is closely bound to his own relationship to his Father: “As the living Father has sent me, and as I live because of the Father so he who feeds on me will have life because of me.’’ The Holy Eucharist is the final link in the sacred chain of the life-giving nourishment reaching from the remoteness of God into the here and now of human existence (Guardini, The Lord, p 238). So when we pray for Christian unity we should pray that our separated brethren may continue to truly and honestly encounter the Lord in the Scriptures. But we should pray also that they may be granted the grace to come and be fed by Jesus in the Sacrament of the Eucharist, and enter into communion with him and his Father. 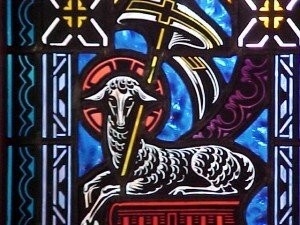 For those of us who are Catholics we first should do as we are instructed in Psalm 95: “Come, let us bow down in worship, let us kneel before the Lord our Maker.” As we do we should be faithfully attentive to the words of Jesus in St. John’s Gospel, turn our gaze to the Sacrament of the Altar, and open ourselves to encounter the full manifestation and boundless love of the Risen Lord in that Sacrament.